SINGAPORE - Employers will no longer be allowed to safekeep money belonging to their foreign domestic workers (FDWs), including paid salaries, from next year. The Ministry of Manpower (MOM) will introduce a new work permit condition from Jan 1, 2019, to protect both employers and FDWs from money-related disputes, the MOM said on Sunday (Oct 7). Speaking on the sidelines of an event held by the Centre for Domestic Employees (CDE), Senior Parliamentary Secretary for Manpower Low Yen Ling said the MOM received an average of 600 complaints a year regarding FDW salary issues in the past three years. Said Ms Low: "We understand that some FDWs, for various reasons, wish for their employers to safekeep their monies and their salary. However, the MOM strongly discourages this practice. "We hope that employers can help their FDWs to open a bank account to allow the FDWs to manage their own monies from their salary." She said this was important to minimise and prevent any unnecessary salary dispute. 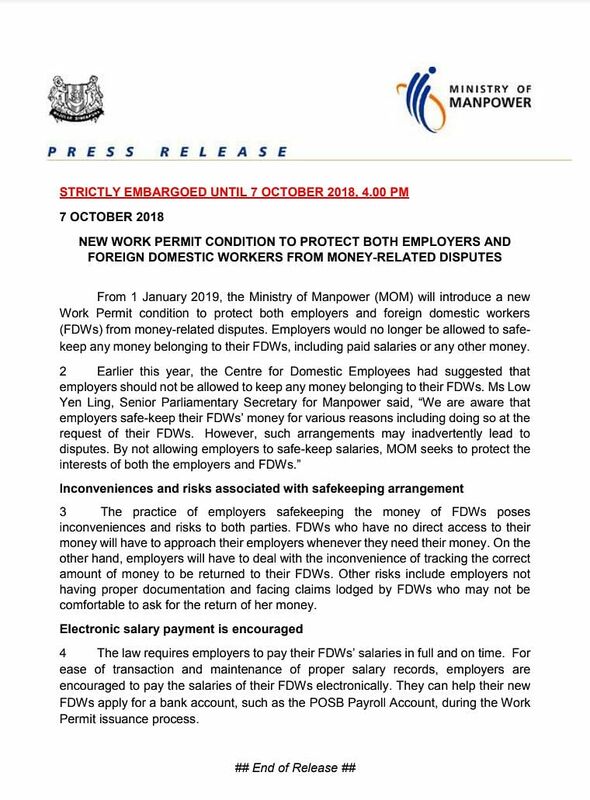 In a release, the MOM said the practice of employers safekeeping the money of maids poses inconveniences and risks to both parties, as FDWs who have no direct access to their money will have to approach their employers whenever they need the money. Employers will also have to keep track of the correct amount of money to be returned to their workers. The law requires employers to pay their FDWs' salaries in full and on time. The new work permit condition follows an announcement last week that foreigners living in Singapore, including foreign workers and maids, will be limited in the amount of money they can borrow from licensed moneylenders. The Ministry of Law and MOM said in a joint statement last week that these foreigners will be subject to new aggregate loan caps when they take loans from the moneylenders, and may apply to be in a self-exclusion framework. On Sunday, at the CDE’s event at Heartbeat @ Bedok, CDE executive director Shamsul Kamar said that since 2016, it has helped FDWs to recover over $219,000 of unpaid salaries including those of workers who had safekeeping arrangements with their employers. “Salary disputes caused much inconvenience to our FDWs, as their family expenses back home are all affected if not paid,” said Mr Shamsul. Since 2016, the centre has been advocating for electronic salary payments for FDWs to minimise salary-related disputes. Mr Shamsul said no worker should have their salary kept by their employers and every worker should manage her own finances and pursue a work-life balance. "We noted the FDWs also wanted a safe place to keep their money, and this safe place is none other than the banks." In December 2017, the CDE, together with over 100 employment agencies, embarked on a pilot project with POSB bank to help FDWs open POSB Payroll Accounts at the centre's satellite and employment agencies' offices. Since then, more than 5,400 such accounts have been opened. At Sunday's event, Mr Shamsul said that from Monday, employers will be able to help their FDW apply for a POSB Payroll account and CDE membership as part of the work pass issuance process, and it can be done online. This is applicable for newly arrived FDWs or those who are transferring to new employers and do not have an existing POSB account. "This makes it convenient for both the employers and FDWs," said Mr Shamsul, adding that the ATM card will be mailed to the FDWs at their employers' residential address within seven working days, without them having to visit POSB branches or CDE offices. Are you in favour of employers not being allowed to safekeep their maids' salaries?